The phrase brings back memories of sports training, many years ago, where success was predicated on effort. The idea being that the harder one worked, and of course the more effectively one focussed one’s efforts, the more likely one was to fulfil potential and/or be successful. In the context of career development a very similar maxim applies. As illustrated here, the amount of information retained through being “talked at” is very low. Whatever about the academic model, where time is scarce and students need to learn about something, such as employability, then it is worth bearing this graph in mind. 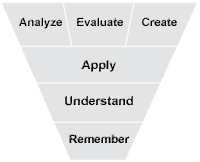 Cone of Learning: adapted from Chad Peterson web-page1. explaining the phenomenon in a way that works from the other person’s perspective. 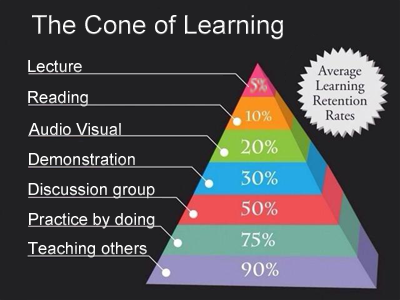 If a student approaches a learning opportunity expecting to be ‘lectured’ for the given period of time then the cone of learning suggests that only 5% of what is transmitted will be retained. There is then scant hope of the information being applied or deconstructed to any further extent. Prosser & Trigwell (1997)2 affirm the research finding of a relationship between student approaches to teaching and their perception of the learning environment. Therefore, in delivering career management and professional development training we tend to utilise discussion group formats, that suggest at least 50% retention of information. Better still if we can incorporate some practice by doing which boasts a 75% retention rate. Playing the percentages? Maybe. However, an approach that boasts a 75% retention rate suggests a far greater likelihood of information being retained, allied to the prospect of knowledge and skills being subsequently applied. From there, it would of course be possible for the student to analyse, and evaluate the knowledge and skills. However, this is all contingent on the amount of effort the learner puts in as this is directly proportional to what the learner gets out, or so I was lead to believe all those years ago. http://visual.ly/cone-learning – seen on 28/10/14. Prosser, M. & Trigwell, K. (1997). Relations between perceptions of the teaching environment and approaches to teaching. British Journal of Educational Psychology, vol. 67, pp. 25-35. Great Britain: British Psychological Society. Airasian, Peter W.; Cruikshank, Kathleen A.; Mayer, Richard E.; Pintrich, Paul R.; Raths, James; Wittrock, Merlin C. (2000). Anderson, Lorin W.; Krathwohl, David R., eds. A taxonomy for learning, teaching, and assessing: A revision of Bloom’s taxonomy of educational objectives. Allyn and Bacon. ISBN 978-0-8013-1903-7.